"Our women of [today] depend too much on tradition in their household affairs. They do not apply their education, but are governed almost entirely by what mother used to make." 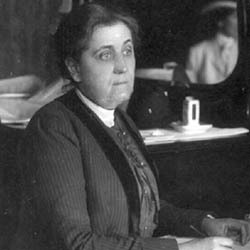 Miss Jane Addams, founder of the Chicago Hull House, delivered a forceful address on what she termed the unprogressiveness of the modern housekeeper, before the Philadelphia branch of the Association of Collegiate Alumni in the New Century Drawing Room, Twelfth street below Chestnut, last night. Her address was entitled "Industrial Adjustment in the Household." "The women of [today] have far more leisure time than had their mothers and grandmothers," she said. "They are taking a greater interest in public affairs and are coming into a larger measure of cultivation. But when we inquire whether they have brought this cultivation into the province of the household we are sadly disappointed. There is a deplorable lack of standard as to what the modern woman is trying to attain in her home. There is no accuracy. There is little care. She does not place on the table the kind of food that is best suited for her husband's occupation or her children's ages. She is regulated solely by tradition. "The intellectual woman is confused. She does not suit the cost of her table to her husband's income. Biology, hygiene and all of the other sciences she has learned at college are forgotten in so far as their utility is concerned. She does not focus her knowledge on her home. She goes to college and studies. When she marries she falls into the rut that her mother and grandmother traversed. She is apt to overfeed her family or else she is apt to starve. Dyspepsia is on one side and debt is on the other. This indefiniteness is the cause of most of our domestic difficulties. The maid-of-all-work sees her mistress floundering about and she becomes listless and loses interest in her work. "These difficulties can never be remedied as long as our women are reticent and as long as they refuse to discuss the problems of household financiering. 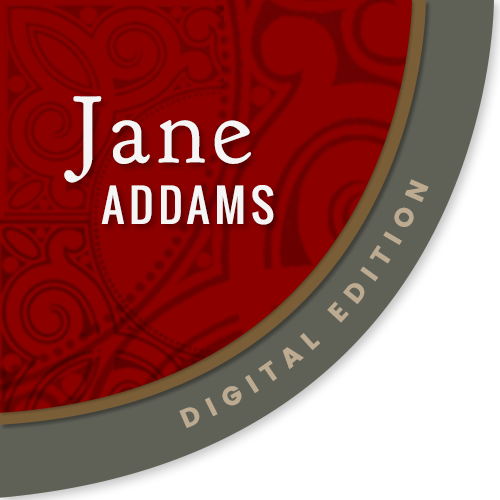 "The solution of the difficulty, I think, is in the exaltation of the household arts. The technique and art-motive in household affairs must be mastered." 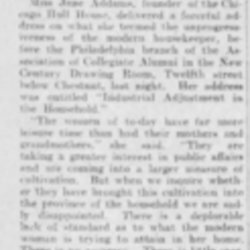 Says Women Show Lack of Standard, Philadelphia Inquirer, March 19, 1903, p. 6. 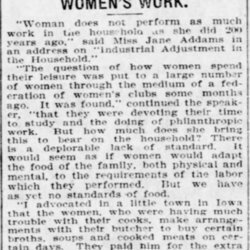 Addams, Jane, “Industrial Adjustment in the Household, March 18, 1903 (excerpt),” Jane Addams Digital Edition, accessed April 22, 2019, https://digital.janeaddams.ramapo.edu/items/show/6691.